Combined with the Vector interface hardware, the Vector PassThru XL Library provides a J2534 compliant PassThru interface/device. Simultaneously, a Vector tool such as CANoe or CANape can be operated over the same network interface. Consequently, you only need one interface to operate both your J2534 application and various Vector development tools. J2534 applications can be operated simultaneously with various Vector tools, such as CANoe or CANape via a Vector network interface. In the field of vehicle electronics development and vehicle diagnostics there are many OEM-specific applications that communicate with ECUs. If these applications are based on proprietary communication solutions, exchanges between communication components involve considerable effort. A modular and reusable solution can help here to save on costs and development effort. The SAE J2534 PassThru standard defines a common communication driver that can be used for ECU diagnostics and ECU reprogramming. If a diagnostic or reprogramming application is built upon a J2534 programming interface, then it is possible to use PassThru hardware devices from different manufacturers. This allows exchanging the communication layer without modifying the application. For these reasons, interest is growing in ECU diagnostics and reprogramming via a PassThru interface in developing and servicing modern vehicles. For vehicles that are sold in the US market, legal requirements have even been in place since 2004 requiring that OEMs provide a PassThru-based application for reprogramming ECUs. 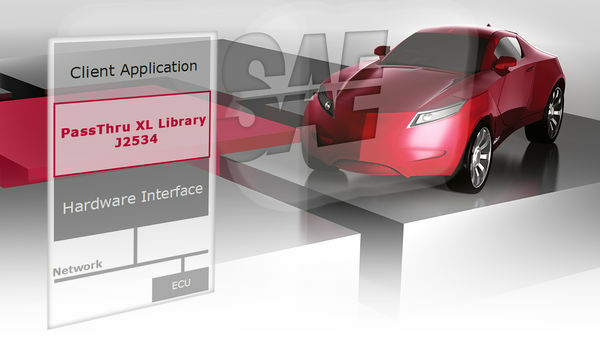 Vector PassThru XL Library offers here a cost-effective solution, especially for OEMs and suppliers who already use a Vector development tool with a Vector network interface and also utilize or develop J2534-based test and flash applications. The PassThru XL Library supports the J2534-1 standard and the most important GM–specific functions of the J2534-2 standard. The library is available in 32-bit and 64-bit versions. The Vector PassThru XL Library can be used with the Vector CAN network interfaces.